Back to back home games and my arthritis dictated that I drive to this one. Donned my £27 adidas hoody bought from the Megastore at the end of last season (reduced from £60!!) So far our games had been played in warmer temperatures but Saturday was a mite more Autumnal so I was glad of a heavier garment. Met Baz, Paddy, Steg and Vasco at the stadium. Consensus was we were unlikely to bag another eight-goal haul and that Stoke would take some beating. They have a mature squad with experienced players. Whilst they were unlikely to cope with our pace, few Stoke players are afraid to put a foot in to break-up play; and, of course, Crouchy provides an almost unique challenge for defenders. Mark Hughes promoted Cameron and Walters from the bench ans Bardsley came through a fitness test. 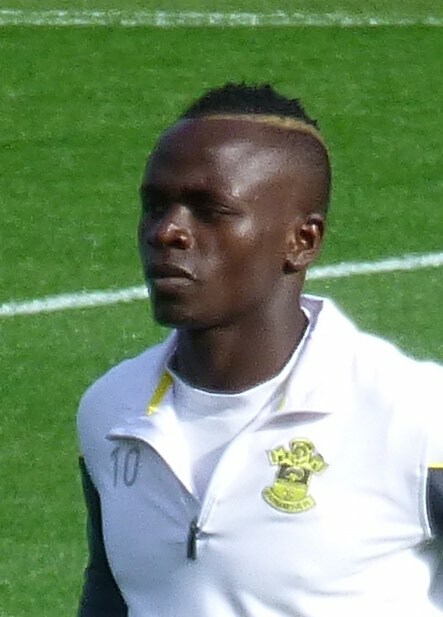 Ron made just one change to last week’s team, bringing Mane in for Long. Stoke had nice away kit – I love to see a sash on a shirt, me. Stoke pressed forward early and won 2 corners which came to nought. It was clear Crouchy fancied his chances of out-jumping Clyne and Bertrand as he regularly went wide when the ball was played forwards. It didn’t take long for Saints to begin passing the ball quickly through midfield and the first half was characterised by some slick end-to-end moves from the home side. On 4 minutes Mane cut in from the right but his cross was too far ahead of Pellè to be dangerous. On 7 minutes the striker set up Davis who dragged his shot wide. Crouchy won a header in the box on 11 minutes but put it too high to trouble Forster. Saints continued to pass the ball crisply and, despite getting plenty behind the ball, Stoke didn’t look capable of shutting us out. On 16 minutes Moses collected the ball on the left and drove into our box. He went past 2 defenders – and we can probably thank Garry Monk for him not diving. Instead he took aim but Forster easily collected his weak effort. Saints were soon threatening again. Mané went to the left-hand by-line and cut the ball back to Pellè at the near post; the big Italian fired over. Stoke continued to try to get forward but the tackles of Fonte and interceptions of Toby curtailed their progress. With good footballers in every position Saints looked as comfortable as it is possible to at 0-0. On 28 minutes a splendid passing move saw a cross into Stoke’s box headed out for a throw. A minute later, Tadić drifted in from the right and his firm, low shot was turned away by Begovic at his near post. A short corner routine picked out Morgan who fired past the keeper but his shot hit the bar and went over. Dušan was becoming increasingly influential and a foul on him on 32 minutes led to our goal. Tadić took it himself, lofting the ball into the box. A poor header away dropped near Pellè and the striker turned and drove a low shot against the far post. With everyone else stood watching, Mane volleyed the rebound past Begovic into the opposite top corner. 1-0. The forward was delighted as there was no way this goal could be chalked off. It was his first for Saints and he made a point of including Ron in his celebrations. As Stoke grew increasingly frustrated the foul count rose accordingly. Adam was guilty of a crude hack on Fonte as our captain carried the ball into their half. Another foul on 38 minutes saw Tadic fire the free-kick over. The first yellow card arrived a minute later – Shawcross was guilty of changing his boots on the pitch!! On 40, another Tadic cross from the right saw Pellè block off his marker but there was no-one moving in behind him. Then Clyne won a corner on the right. Another short corner saw the ball worked infield where Mane was promptly fouled. This time Tadić's shot bounced harmlessly off the wall. As half time approached, Mr Moss seemed cross at time-wasting. HT 1-0. There were no changes at half time but one felt Hughes may have given his charges a good talking to as they played with greater ambition after the break. Even so it was Saints who created the first decent chance. Tadić was again the provider and Pellè's shot dropped down after striking the bar. Steve Davis was following up but could not keep the ball in play. Stoke then enjoyed their best period winning 2 corners and a potentially dangerous free kick. Saints coped admirably with Forster dominating his box as required. On 53 minutes Adam was replaced by Diouf and Stoke went 4-3-3. Soon Walters worked himself a shooting opportunity but his effort rolled wide. It was becoming a more competitive affair with Stoke beginning to match us in midfield. Ron reacted on 62 replacing Cork with Wanyama. Saints fans were concerned when Tadić went down and needed treatment. Fortunately he was soon back on the field. On 64 Mané knocked the ball back for Pellè but the #19 fired over. Another terrific passing move then saw Tadić shooting wide. On 69 Stoke brought on Arnautovic for Walters. Stoke won a free-kick but were penalised – I think someone was offside. Saints went straight down the other end and Begovic was obliged to field the ball at the feet of Schneiderlin. On 76 a Tadić corner from our left saw Pellè rise like the proverbial salmon but he planted his header wide. Stoke’s next attack saw an overhit cross sail past Crouch. Then they took off Moses and brought on Assaidi. Baz thought the game had got “bitty” and it was clear both sides were tiring. On 81 former Skate Wilson was booked for fouling Mané. Davis lofted the resulting free-kick but Begovic claimed the cross. Another Stoke corner saw Crouch penalised for pushing but it was noticeable that Stoke were hurrying now. They didn’t deserve a point but still hoped for one. 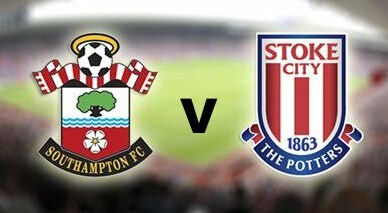 On 86 another Tadić pass was blasted over by Pellè but Stoke went straight down the other end where Forster was obliged to claim another cross. Saints second substitution saw Gardoş replace Davis allowing Toby to sit alongside Big Vic. Schneiderlin went forward and as 90 minutes ticked by he and Pellè were wasting time near the left-hand touchline. Mané then cut into the box but his cross was intercepted. Further chances were created in the 4 added minutes with Diouf failing to reach a right wing cross. Then Assaidi shot wide while at the other end both Pellè and Mané sent efforts wide of the mark. Jon Moss’s whistle brought an end to proceedings. Whilst 1-0 seemed meagre fayre after last week’s banquet, you still get the 3 points for the win. With City losing at West Ham, Saints were back up to second. I was in a good mood as I got into my car at 5pm. At 6pm I was seething as I watched the Ferry depart without me. Southampton huh – love the football – bloody hate the traffic!